I have a love of crafts, which began at an early age. Like many of my peers (Generation ??? ), I learned to knit and sew in grade school (Thanks to you, Girls Scouts!). I explored many crafts, including sewing, photography, quilting, and polymer clay. In the early 00's I took a beginners lampworking class with Stephanie Maddalena and it all clicked. I found an art form that became an obsession. I have studied under Jennifer Geldard and Cynthia Leibler Saari, in addition to Stephanie. 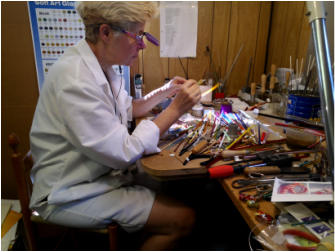 I demonstrate lampworking at summer camps, craft shows and classrooms and love to introduce young folks to the joys of artistic creation. I believe that artistic expression, whether in the kitchen, in a garden or in an art studio, is an intrinsic part of each person’s soul. Love of, and the desire to be exposed to, beauty is not only a human longing, but it is very humanizing. My studio is in Cape Cod, MA, where my family and I live in an circa 1889 house near the beach. Along with my husband Bruce, we work, read, garden, keep bees, make our own wine and hope to open a public lampworking studio in the future.